Australasia, New Zealand, East India Islands, etc. etc. 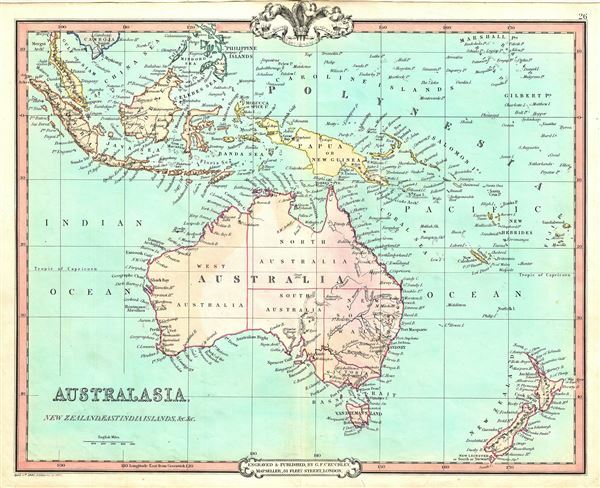 This is a fine example of George Frederick Cruchley's 1852 map of Australia, New Zealand and the East India Islands. It covers from the Malay Peninsula to New Zealand, including Australia, Malaysia, Indonesia, Philippines, Papua New Guinea and Melanesia. An interesting map issued just as most of the earth's non-polar shore has been explored. Gone are many of the errors of the previous century with the coastlines accurately rendered. Inland though, much remained confused. Vast stretches of unmapped territory and speculative cartography fill central Australia, New Zealand and Papua New Guinea. Regions and territories are color coded with elevation rendered by hachures.